The Australian Government has now released its hotly anticipated Competition and Consumer Amendment (Competition Policy Review) Bill (Exposure Draft), to implement, in full, the competition law reforms recommended by the Harper Review Panel. 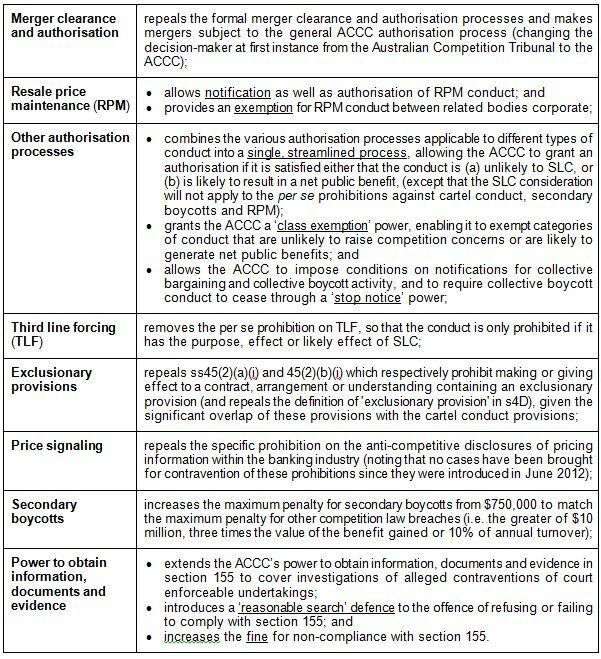 The proposed changes are being made to strengthen Australia’s competition law and deter anti-competitive conduct. It is important that businesses understand what they may or may not do if these new laws are passed. In this Alert we have summarised three important changes relating to misuse of market power, concerted practices and the national access regime. The Exposure Draft also contains a number of other significant changes to the Competition and Consumer Act 2010, so we have also created a “Quick Reference Guide” of the key proposals to assist you in keeping track of the new laws. The headline amendment is a new misuse of market power test. The current test has been notoriously unenforceable, requiring an anti-competitive purpose. The new provision adds an “effects” test, which focuses on the likely impact of the conduct on competition rather than focussing on the subjective intention of the party engaging in the conduct. The new test is likely to capture a wider range of behaviour, and make it easier for the ACCC and small and medium enterprises to show that a dominant player in the market has misused its market power. Once the new laws take effect, businesses with a substantial degree of market power will need to carefully review their decision making practices to ensure that the likely competitive impact of their unilateral conduct is always assessed. Further, businesses that are concerned about the legality of their proposed conduct should consider seeking ACCC authorisation (an avenue not previously available in respect of misuse of market power). A new ‘concerted practices‘ prohibition is also proposed. A concerted practice is a form of coordination between competing businesses by which they effectively cooperate with each other, rather than vigorously competing. The simple act of sharing sensitive information between competitors (such as output intentions, details of pricing or tender responses) could be sufficient to contravene the new laws if there is likely to be an impact on competition, even if there is no mutual agreement or commitment between the competitors as to how that information will be used. This contrasts with the existing laws which require that competing businesses have entered into a ‘contract, arrangement or understanding’, a threshold which is more difficult to prove. Going forward, businesses that routinely interact with their competitors (for example, via industry associations), should ensure that they only cooperate with competitors for legitimate reasons and share information on topics that are unlikely to impact on competition. The national access regime is proposed to be simplified. Importantly, in declaring a service for access the “uneconomical to duplicate” criterion, which the High Court found difficult to satisfy, would be replaced by a criterion of whether “total foreseeable market demand could be met by the facility at least cost”, a test preferred by the Productivity Commission. While a facility would still need to be of national significance to be declared, and access must be in the public interest, the new law should enable greater third-party access to bottleneck infrastructure. The consultation period on the Exposure Draft legislation will run until 30 September 2016. 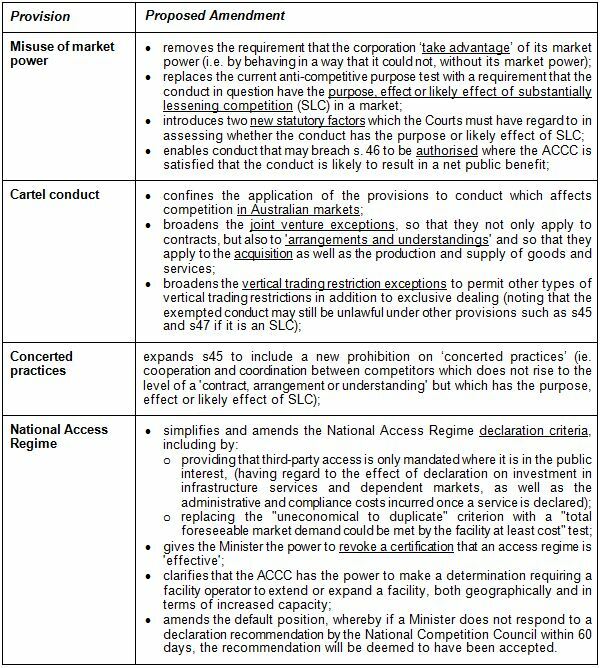 The ACCC has concurrently published two sets of draft Guidelines regarding its proposed approach to enforcement of the amended misuse of market power provision and the new prohibition against concerted practices. The ACCC’s Guidelines are intended to provide clarity regarding the types of conduct that will, and will not, raise concerns for the ACCC. The ACCC is inviting feedback on the draft Guidelines from interested parties by 3 October 2016.